At ebay.in you can purchase Micromax Canvas Lapbook L1160 RAM 2GB (DDR3L) MR WIN10 * Black for only Rs. 9,799, which is 18% less than the cost in Amazon.in (Rs. 11,999). 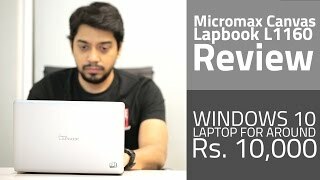 The lowest price of Micromax Canvas Lapbook L1160 11.6-inch Laptop (Intel Quad Core/2GB/32GB/Windows 10/Integrated Graphics), Silver was obtained on February 16, 2019 3:33 pm. Create a snappy and magnificent start every time around the Canvas Lapbook L1160, a slick laptop with pre-installed Windows 10 and around 10 hours of battery backup. The Intel Quad Core Processor (around 1.83GHz) provides quick, smooth and potent functionality. Stream films on the 29.46cm (11.6) IPS screen while the Double Speakers give you a genuine sense of action flicks. It is a powerful laptop that is designed with a streamlined edge, metallic finish, and stylish body. It is very light-weight and ultra-thin that you can carry easily everywhere you go be it a business trip or to your office. The pre-installed Windows 10 on the Canvas Lapbook, makes you more productive as you can switch between mails, music and match scores with Snap Assist. You also have Cortana to help you find out show timings and setting reminders for you. Its 4100mAh battery gives you 10-hour battery backup and enables you to do your work all day long. Its inbuilt Wi-Fi connectivity allows you to check mails, watch a video and upload attachments. Exchange records and playlists with friends through two USB 2.0 slots and Bluetooth 4.0. Watch your favorite movies on the large screen together with the HDMI port. Intel Quad-Core Processor (up to 1.83GHz) and 2GB DDR3 RAM makes your work fast and smooth. It comes with a 0.3MP front camera for video conferences and video chatting with your friends and family members. Its 29.46cm (11.6) IPS display offers an immersive experience while watching movies. Its 32GB inbuilt memory makes a place for all your library of movies, music, and games.